In a hospital room in Yemen, well-wishers sing songs and play the guitar for five-year-old Buthaina. She smiles and tears begin to drop from her eyes. She then picks up her crayons and draws a sketch of her family. Buthaina Muhammad Mansour al-Raimi is the sole survivor in her immediate family after an airstrike destroyed an apartment building in Yemen’s capital on August 25, according to Yemen’s Houthi-held human rights ministry and information ministry. The group also says the attack killed 16 people, including Buthaina’s parents and five siblings. Buthaina, now in the care of her aunt and uncle, her new guardians, doesn’t know that yet. None of her relatives or doctors have told her. The last family photo of the al-Raimi siblings together before an airstrike hit their homes. Buthaina, far right, is the only survivor. Dramatic photographs published after the strike showed Buthaina being pulled from the rubble, her eyes sealed shut by bruises. Shortly after, local media tried to interview her while she was on her hospital bed. Buthaina tried to force one of her eyes open to see who was speaking to her. Little did Buthaina know that the tiny gesture would turn into a symbol of Yemen’s plight. The photograph capturing the moment prompted a powerful social-media campaign, highlighting the country’s humanitarian crisis. Hundreds of tweets showed pictures of people mimicking Buthaina’s gesture around multiple hashtags. At her hospital room this week, Buthaina is surrounded by relatives and well-wishers. The walls are decorated with children’s drawings and balloons cover the ground. Doctors say Buthaina has a fractured skull and many bruises to her body. Her uncle says they don’t know when she will be discharged from the hospital. The young girl’s cousins try to entertain her with dolls. Buthaina, her rumpled curly hair tied in a ponytail, sits at the center of the gathering. “She lost her entire family. 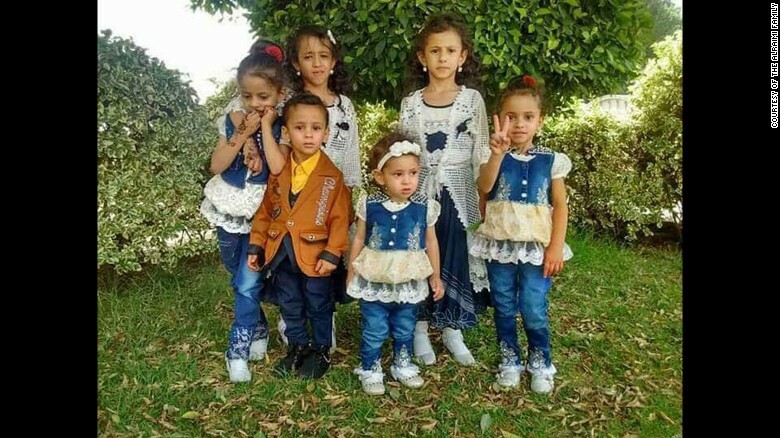 It’s been 10 days since they died and she still asks her uncle when her parents will visit her,” Yasser al-Ghori, head of the emergency department of the hospital treating Buthaina, told CNN. 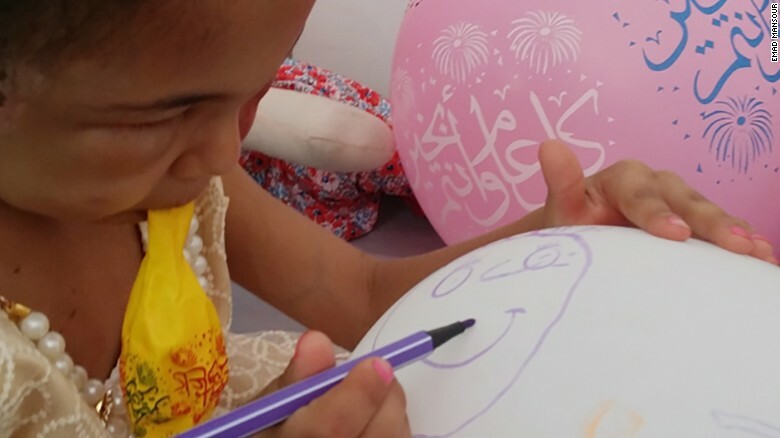 Buthaina draws on a balloon brought to her by one of her visitors. “I can never replace Buthaina’s father but she is my daughter now and will be forever. We hope our loss will lead to the end of the nearly three-year war that devastated Yemen and killed thousands of innocent children,” Ali al-Raimi, Buthaina’s uncle and guardian, told CNN. Since March 2015, the UN Human Rights Office has documented some 13,829 civilian casualties, including more than 5,000 people killed. Late at night, Buthaina wakes up screaming and crying, said her aunt Samah al-Raimi, who has been sleeping next to her. The woman added that she has trouble knowing whether the source of Buthaina’s anguish is physical pains or bad dreams about the deadly night. “Buthaina is a priority to me and I give her double personal time, compared to my daughter Sumayya. That is still not enough because the tragedy she went through cannot be forgotten, not now, not forever,” Samah al-Raimi told CNN. The ongoing Saudi-led military campaign against Yemen’s Houthi rebels has prompted a string of humanitarian crises. According to UNICEF, a child dies every 10 minutes in the war-torn country from preventable causes like diarrhea, breathing infections and malnutrition. UNICEF has also dubbed Yemen home to “the world’s largest humanitarian crisis,” as well as the world’s biggest cholera outbreak, with over 600,000 cases of suspected cholera recorded by the World Health Organization in just four months. But the bombings are also taking a horrific toll. During the same week of the airstrike that killed Buthaina’s family, the United Nations estimates that 58 civilians have been were killed in airstrikes, including 42 in bombings by the Saudi-led coalition. 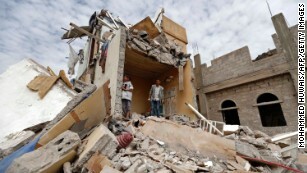 That death toll is higher than in the entire month of July, which saw 57 civilian deaths. Saudi Arabia has acknowledged the deadly airstrike and said it resulted from a “technical mistake,” according to a statement from the state-run Saudi Press Agency on August 25. The attack flattened two buildings in Sanaa’s southern district of Faj Attan, amid escalating violence in the war-torn country. 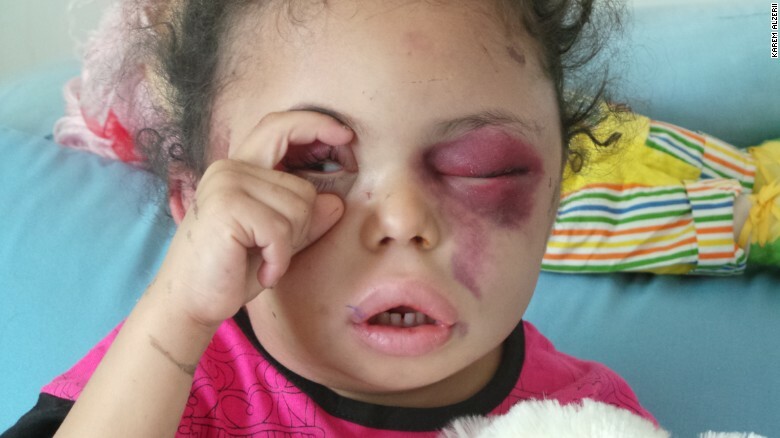 Buthaina’s supporters in Yemen say they hope that the girl’s pain will open the eyes of the rest of the world to a war that has gone unnoticed by far too many for far too long.